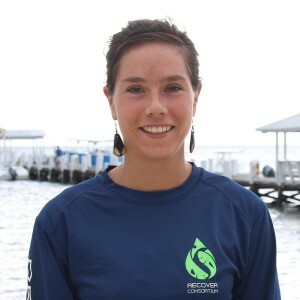 Lela Schlenker joined Dr. Martin Grosell’s lab at the University of Miami’s Rosenstiel School of Marine and Atmospheric Sciences (RSMAS) as a Ph.D. student in the summer of 2015 to work on the RECOVER project. Lela graduated from Smith College with a degree in Biological Sciences in 2009 and spent several years after graduating gaining experience in fisheries science working with salmonids, elasmobranchs, reef fish, and blue crabs all over the United States and including work in the Gulf of Mexico shortly after the oil spill. Her work with a wide variety of fisheries convinced her of the importance of physiology in understanding threats to the conservation of fish populations. Lela completed her Master’s degree in the summer of 2014 at the College of William and Mary, Virginia Institute of Marine Science (VIMS) under the supervision of Dr. John Graves. Her Master’s research focused on post-release mortality and stress physiology of recreationally caught white marlin and peaked her interests in looking at the many ways that stress affects the behavior of pelagic fishes. She is especially excited about working on the RECOVER project to investigate whether oil will affect the olfactory acuity and behavior of mahi-mahi in the laboratory and in the wild.